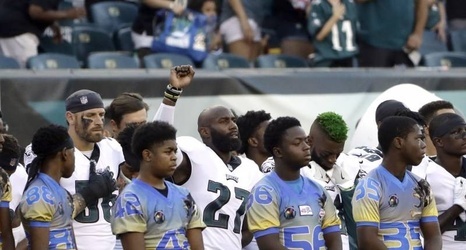 Philadelphia Eagles safety Malcolm Jenkins raised his fist during the national anthem during Thursday's preseason opener against the Pittsburgh Steelers, according to Tim McManus of ESPN. This form of protest against racial injustice is a continuation from what he did throughout much of the year last season. The NFL had announced a new policy for the national anthem that required players to stand if they were on the field, but the changes were placed on hold while the NFLPA negotiates a resolution that would be beneficial to the players as well.